The Ion Age is running some special offers for their Mullo AFV over on their website. Go check it out. 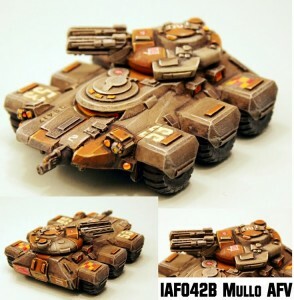 The IAF042 Mullo AFV is now online in our latest Early Supporter Offers (ESO's) and its a great chance to get yourself a medium science fiction space opera vehicle unlike almost any other. . These offers run from today until 30th September 2014. All orders containing a Mullo AFV will be mailed out on that date worldwide. Go to our Early Supporter Offers page. Three Variants of a Medium Wheeled Vehicle. This offer gives you the chance to get this high quality 15mm scale resin and white metal vehicle kit at a 10% saving if you purchase one (9.00GBP rather than 10.00GBP) or a 15% saving if you purchase three (25.50GBP rather than 30.00GBP) or a 25% saving if you purchase five (37.50GBP rather than 50.00GBP). Excellent! Make your choice from the drop down menu on the product page. Every order placed gets IMP013 Alouten Veteran (worth 0.60GBP) included free automatically! Click on the link for more images and information.